This is the home you&apos;ve been waiting for! Dreaming of the perfect one story home with first floor laundry, on the lake? Stop looking and start packing your bags. The perfect escape for you will feel like an oasis with a fenced in yard right on the lake. Enjoy lake living in over 3, 200 sq ft of finished living space in this open, spacious floor plan with lots of natural light. Four generous sized bedrooms, 3 gorgeous bathrooms and loads of storage. The master bedroom with en suite boasts lovely views of the lake and a beautiful soaking tub in the bathroom. The views of natural spring-fed Anderson Lake are gorgeous from the many windows, deck or the lower-level patio. 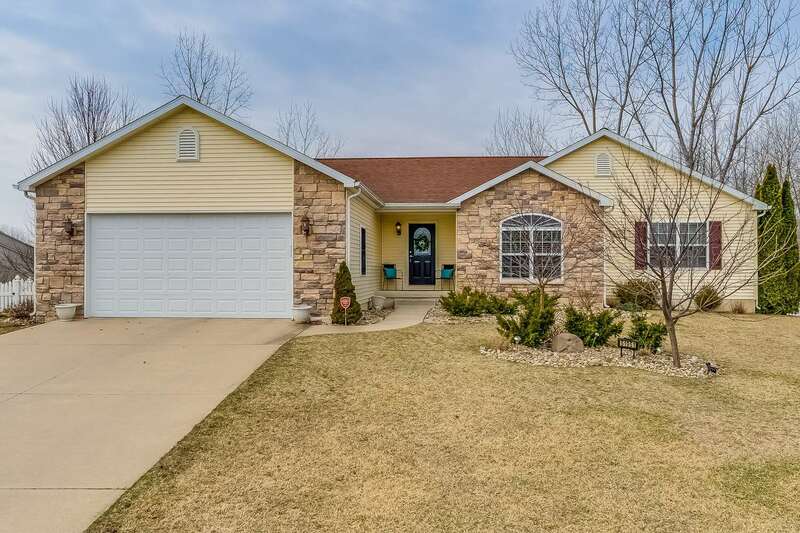 The kitchen has been remodeled in the last couple years with all new appliances, granite counters and tile backsplash, the bathrooms have been updated, all newer wood and tile flooring, all newer carpet, lighting, paint, hardware, decking, and more. The walk-out basement is always perfectly dry, even in the Flood of 2018! Bright and airy basement doesn&apos;t even feel like a dark enclosed basement with all of the large windows and sliding glass doors. This is a great value for this much living space on the water in Horizon, Discovery, and Penn schools.